An organic mattress is what many people would like to have. But before we proceed, let’s clarify a thing or two. The term itself is a misconception. You should remember that when expecting to find the best organic mattress. 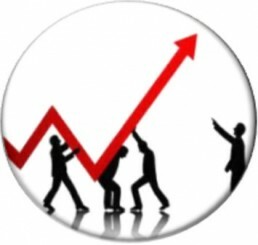 I personally use it because most people use it but the term does not necessarily indicate what people want when they say it. Many materials are organic. Polyurethane is one of them, as well as polyester and many others. What is different about them is that they are synthetic. On the other hand, steel and titan and many other alloys used in coils production are most certainly not organic. But that doesn’t stop people from calling mattresses that have them “green.” So there is no “organic”/”inorganic” split like one could be led to believe. It’s more of a “natural”/”synthetic” dilemma. Granted, there’s little natural about alloys anyway, but… let us not indulge in technicalities any further. Why is an organic mattress, or whatever we should call it, better? The thing is, it is not necessarily better. Some people might think so but I am not one of them. Organic mattresses have their own uses and sometimes they might be the only sensible choice. But most of the time, it is a matter of personal preference. Ok, so what are their own uses? Organic mattresses are good for people with allergies. But that depends on what kind of organic material the mattress is made of. Latex and wool might be allergenic in their own right despite being hypoallergenic in general. Cotton is generally the best material to make the cover—and the filling—from. 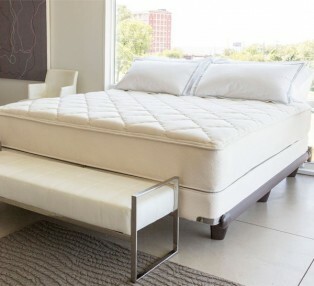 An organic mattress main feature is the simple fact it is… well, organic. As such, it is not necessarily superior to other mattresses. But while some might consider it substandard, the truth is it is still an organic mattress. Either way, while this mattress might never enter a top list with another type of mattresses in, it is my no means a bad mattress. No harmful chemicals, forget about them. What you get is cotton fabric, cotton filling, orthopedic springs that would be perfect for a child, and strong edge support. The filling has two stage firm and soft thickness. I think you’ve noticed I said: “for a child”. This mattress is indeed meant for children. After all, it’s children who need organic mattresses most. We, adults, can make it just fine without one because we already are grown up. 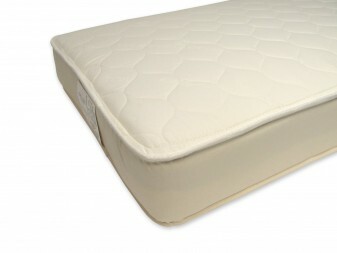 The mattress is hypoallergenic, free from chemicals and at the same time cheaper than a latex mattress. Besides, many people don’t really like latex mattresses to begin with. If you’re one of them, this mattress will be perfect for your kid. 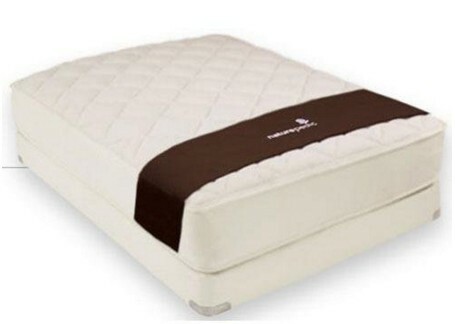 If you would like you child to sleep on an organic non-latex mattress, all you have to do is to follow this link and make your order on Amazon.com. Price is not one of the reasons you should buy this mattress. Nope, absolutely not. This mattress is expensive. Very much so. No, the reason to buy the mattress is that it is simply perfect. Of course, much like the previous mattress is consists mostly of cotton. Much like the previous mattress, this one is also an innerspring mattress. However, this is a step up compared to the first mattress. Granted, that mattress is just as much hypoallergenic as this one, that’s not new. What is new is that the Essential Genesis has two layers of individually wrapped high-density micro coils. 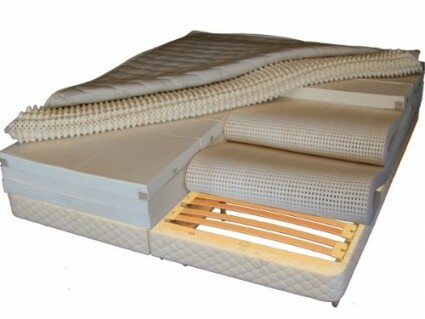 It is a very unusual occurrence for spring mattresses, to have a sophisticated design like that. After all, innerspring mattresses are considered some of the cheapest and not many manufacturers are willing to develop a new method, mostly investing into memory foam and latex. The dual spring system provides perfect support not unlike what the best mattresses made with other technologies can offer. Not just the support but also pressure relief. It is naturally breathable even without employing any special technologies, as well as fireproof. Without any kind of chemicals! That is not to say the mattress lacks synthetic materials. To be specific, the coils are wrapped with polyester fabric. It is hypoallergenic, yes, but it is synthetic. So if you want a strictly natural mattress, this one might not be for you. Otherwise, you can order it online on Amazon.com if you follow this link. While this is an organic mattress, it is also a latex mattress. There is no doubt that latex is natural material but this is still a tricky matter. The thing is, both Talalay Latex and Dunlop Latex may be made of natural stock material but after the process is completed the latex is no more 100% organic. 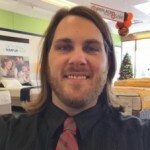 The reason I still include this mattress into this list is that the natural materials the mattress is made of are not limited to Talalay Latex alone. The cover is made of knitted wool quilted to 1 inch. It’s worth noting that the cover is fire resistant. 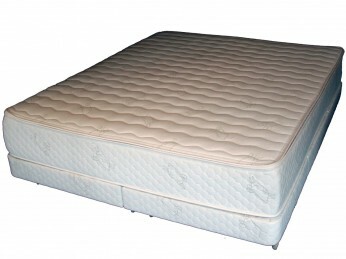 The latex layers are adjustable and offer 13 firmness level for the sleepers as well as pressure relief. 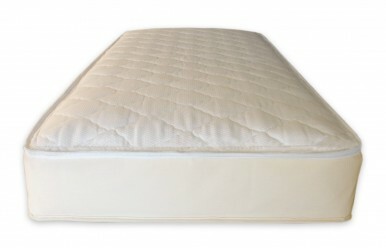 The mattress provides lumbar support and it is a good choice for side-sleepers, too. The overall height of the mattress is 12 inches. 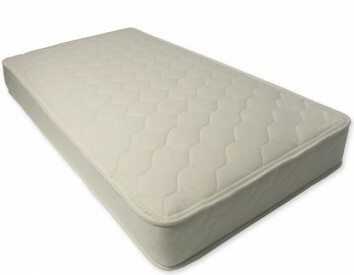 If you don’t mind a latex mattress, make sure to follow this link so you can order this one on Amazon.com. This mattress has no latex, unlike the previous one. And this is a good thing. Latex maybe hypoallergenic but it’s still possible for some people to be allergic to it. The mattress also has no wool. While organic, it is not pleasant to the touch for some people. But cotton is a good substitute. Scratch that, it’s a better substitute. 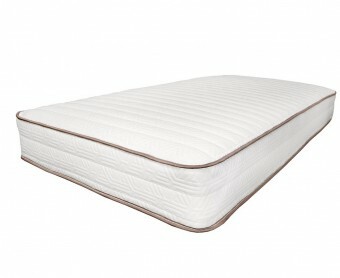 Luxurious and quilted, that’s would make a perfect cover for any mattress. However, it is not waterproof. It offers no water or dust-mite protection by itself. But don’t be disappointed just yet. After all, the mattress is fireproof. That’s a more crucial thing anyway. The filling is also made of cotton, only grown and certified in the U.S. at that. Of course, the mattress isn’t just stuffed with cotton. It also comes with springs for support and pressure relief. The firmness level is about average. This mattress is manufactured by a family owned business and because of that, they pay attention to every little detail, which, of course, is very nice. If you want to purchase this mattress, you can do so on Amazon.com. Here it is! The number one organic mattress. Perhaps, it is not made in the U.S. entirely (it’s actually manufactured in New Zealand and handcrafted in Chicago) but it still deserves the first place. It is a mattress perfect for children but designed not just for them. It is also good for grown-ups, especially those who prefer firm sleeping surfaces. The mattress overall height is eight inches and a half. The mattress has no latex but does have some wool as well as cotton. The wool also serves as a flame barrier. No chemicals, the fire resistance is natural. Just like any other organic mattress, this one comes with springs. The independently wrapped pocketed coils provide perfect support, pressure relief and also reduce motion transfer. However, unlike some mattresses in this list, the My Green Mattress is relatively cheap. Please note I say “relatively,” but it’s still nowhere near several thousand dollars. Add to that the 90 nights free trial period, and you have a deal that is not that easy to refuse. If this is your opinion as well, make sure to follow this link in order to purchase it on Amazon.com. As you can see, when it comes to organic mattresses, they mostly belong to the innerspring type. But they also have an organic filling. The reason is that the filling itself would not be able to provide proper support entirely by itself most of the time. The springs are a necessity both for support and cushioning. 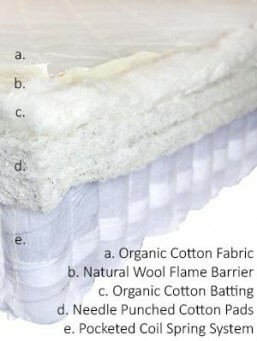 Some of the organic mattresses have wool, cotton or latex. In my opinion, the best organic component is cotton. Latex and wool might be allergenic to an extent although wool less so. If you want an organic mattress for your baby, consider looking through the crib mattresses section. But either way, you’re the one who needs a new organic mattress and it’s your call in the end.